Maybe during a five-game losing streak wasn’t the best time to check in on the Nova Caps mailbag. It is overflowing with angst, worry, and distress. You know, like the good ol’ pre-Stanley Cup days. Is the honeymoon over, the championship goodwill spent? Let’s reach into the mailbag to find out. Time to end the Todd Reirden experiment, don’t you think? I’d love to have Barry Trotz back right about now. Here’s the thing, “Regretful”, Unless you have a customized DeLorean and a trunk of plutonium, Barry Trotz isn’t going to be the coach. We can debate the nature of his departure, but he is gone. General Manager Brian MacLellan got his man. It is too early to know for sure if Todd Reirden is in over his head. Washington has collected 59 points in 48 games thus far. Through 48 games last year they had 61 points. Not exactly a huge drop off. This time last year people were calling for Trotz’s head. The team pulled itself together with epic results. Can Reirden lead them to the same this year? Hopefully. Maybe part of fan worry is that Reirden sometimes looks overwhelmed behind the bench. He wears his emotions on his sleeve far more than the stoic Trotz. He makes funny faces, shows frustration, and vents his anger for all to see. He reminds me a bit of Bruce Boudreau in this regard. Trotz’s calm demeanor at the very least gave the illusion that he was under control. You know what Reirden does not do, though? He doesn’t attempt ill-advised cross-rink passes three feet into the offensive zone. He’s not the one pinching at inopportune moments springing opponents on odd-man rushes. He doesn’t coast on the back check. These things are on the players. Where Reirden can make an impact is holding the players accountable when they make lazy plays or bad decisions. Managing the locker room, massaging the team psyche, and holding players accountable are musts for Todd Reirden and his staff if the team is to get back on track. Giving up 8 goals to the worst team in the league? How is this possible? Hey “Peeved”, I hear you, but think about it. A mid-January, early matinee, NBC Sunday game? These rarely end well for Washington. I held little hope that would be the game for the Caps to right the ship. Or maybe, on NFL championship weekend, the boys got confused and gave up a touchdown and two-point conversion. Either way it was ugly. What do you think of Mike Milbury saying Evgeny Kuznetsov plays with “the tenacity of a French poodle” on Sunday’s broadcast? What do I think? I think ‘tenacity’ is a big word for a guy who has the mental acuity of a tube sock. But we must admit something is going on with Kuzy. We’re talking about a guy who looked ready to use his spectacular playoff as a springboard to a Hart Trophy-caliber season. Is he feeling the pressure to do so? Is he resting on his laurels? Is he still feeling the effects of the elbow to the head he took in Winnipeg in November? It could be any or all off the above. A head injury can make any player a little gun-shy, make them play tentatively. The Caps need Kuzy to, if not take the next step, at least rebound to the form he showed last season. Currently, he struggles with defensive coverage, routinely gets whipped at the face off dot, and seems like he couldn’t score if the goal was twice as large. Without a super-charged Kuzy, the Caps are in trouble come April. As much as we all hold great disdain for anything Penguin-related, I hesitate to even make this suggestion: Kuznetsov should look to Sidney Crosby for inspiration. Crosby spent a summer turning a weakness at face offs into a strength. For all his whining, Crosby is unafraid to work in the dirty parts of the rink to score goals. He pairs tremendous talent with a relentless work ethic. Kuzy, with his creativity and skill, has an unlimited upside, but until he sharpens the less glamorous parts of his game we’re not going to see his bird celebration nearly enough. The Caps have a lot in their game to clean up. If you could wave a magic wand to change one specific thing what would it be? One word: Effort. For a decade we wondered if Washington could ever cobble together the right combination of heart, hustle, and immense skill to win it all. For all their talent, they never seemed to want it enough, to play full sixty-minute games, the compete level never matching their abilities. Last Spring, they caught lightning in a bottle, finally realizing what it takes to get the job done. After they won, we wondered if the team would stay hungry enough to repeat. It was easy to say the players knew what it took, felt good to assume they would duplicate the effort. Now, the old questions have returned. For long stretches this season, especially during this five-game losing streak, the Caps have been sloppy. They are failing at the fundamentals. Passes are not crisp. An inconsistent forecheck makes too many offensive zone possessions “one and done.” The cohesive, five-man defensive unit that stifled playoff opponents has been nonexistent. Gap coverage disappears as opponents fly through the neutral zone. Lazy, stupid passes are easily picked off and turned in the other direction. Offensive opponents are camping out in front of Holtby and Copley without fear of being punished or even being moved out of the crease. Each of these deficiencies is tied directly to effort. The extra effort of a speedy backcheck. The extra effort to win a battle along the boards. The extra effort to effort to make sure you clear the defensive zone. The extra effort to chip a puck in deep instead of making a low percentage pass at the blue line. These effort plays are all about “buy in” and “want to.” Hustle is a great equalizer. Last year, the Capitals, from shot-blocking captain to icing-erasing grinder, bought in, making the simple plays necessary to win. If the Caps would just make the decision to display greater effort on their own they could put themselves in position to repeat. And I could use the magic wand to conjure a lifetime supply of Cheetos. Do you guys know the procedure for getting my playoff ticket deposit money back? Am I crazy to not be overly concerned with current state of the Capitals? What’s this, a ray of sunshine in the mailbag? Careful, Calm, positivity is in short supply among the Red Rockers if the comments sections and talk shows are any indication. You are right to be optimistic, though. It is much too early to mash the Panic Button. There is too much talent on this team for the offense, including the power play, to remain dormant for long. Typically, the bye week and all-star break don’t help the Capitals, often halting momentum. This season the break may arrive at the perfect time. These guys have played more hockey than ever before in the last year. A week off might be enough to recharge the legs and the minds. GM Brian MacLellan will likely tweak the roster at the trade deadline. As stated earlier, this club knows what it takes to win. The Eastern Conference is going to be a dogfight to even make the playoffs, but I am confident the Caps have the makings of another deep run. As last year taught us, it’s okay to believe. 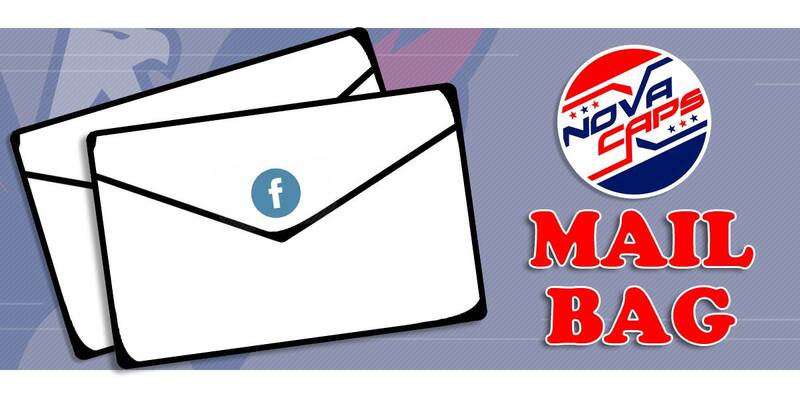 That wraps up this edition of the mailbag. Keep the faith and keep sending those letters. I have been a Washington Capitals fan for over thirty years. Some of my favorite memories are rocking the red with friends while cheering the Caps and rooting against their Patrick/Metropolitan Division rivals. This entry was posted in News and tagged Barry Trotz, Brian MacLellan, Bryan Hailey, Mailbag, Todd Reirden, Washington Capitals Fans. Bookmark the permalink.